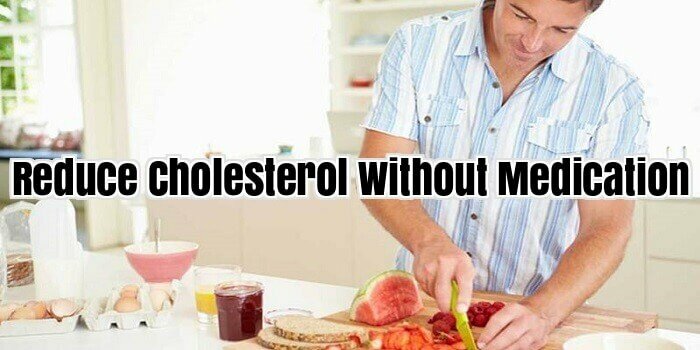 There are various ways to reduce cholesterol without medication. Many people choose to go this route as they do not want chemicals on their bodies and also don’t like the possible side effects that these medications can bring. In addition to reducing your blood cholesterol, these natural approaches also result in a lot of health benefits for you. Here are five ways to help you reduce cholesterol without medication. The basic foundation of reducing cholesterol without the use of any medications is a good diet. This doesn’t meaning starving yourself or only eating foods that are labelled “low cholesterol.” What you need to do is eat a balanced and varied diet that is high in vegetables, whole grains, fish, fruits and legumes. Also, you need to minimize your intake of red meat, eggs and cheese, which contain saturated fat. Combining a balanced diet with other natural approaches can actually help reduce your cholesterol level in a similar fashion as that of a statin, a cholesterol lowering medication. Research has shown that it can lower your bad cholesterol (LDL) by almost 40% and can even shrink the deposits that have formed in your arteries. Another important way to reduce cholesterol naturally is exercise. Studies have shown that routine aerobic exercise done continuously for about three months can increase your good cholesterol (LDL) by about 5 to 10 percent. What you should aim for is at least 30 minutes of physical activity daily. Supplements are not considered medications, and they’re a good way to reduce cholesterol if you’re not getting enough nutrients from the food you ingest. Though many supplements have not yet been proven to have an effect on your cholesterol profile, there are also some supplements that provide nutrients that are really helpful in reducing cholesterol. A regular dose of Niacin or Vitamin B3, for example, has been shown to increase your HDL by at least 15 percent and decrease your LDL by about 20 percent. The problem with high doses of Niacin is that it can also cause side effects, and this is especially true when it’s combined with a statin. So always consult your health care practitioner first before taking any supplements. If you’re not at your ideal weight, your body may not metabolize fat well and make it difficult to reduce your cholesterol. So compute your body mass index or BMI to learn if you’re at your recommended weight, and if you’re not, start making some changes to get to that ideal. Though a small amount of stress can actually make us work better, being overstressed can make the LDL levels in our blood shoot up. It also causes us to overeat, which results in us gaining additional weight and developing all sorts of other health conditions. Reducing your daily stress level can prevent you from developing heart disease as well as reduce your cholesterol level. The intake of cholesterol medication to lower down the cholesterol levels will eventually create cholesterol medication side effects. For those that think they would have none it can be quite possible. The cholesterol medication side effects would depend on the individual taking it. It is important you arm yourself with the right knowledge concerning the benefits of the medication against the side effects. It is suggested by medical professionals that you stick with the prescribed dosage and intake of the cholesterol medicines. This will prevent to further deepen the cholesterol medication side effects. Some of these cholesterol medication side effects may easily be treated while others can be potentially deadly to the person experiencing it. You have realized that you really need to focus your attention in lowering your cholesterol levels. You doubt that any kinds of drugs will do the trick for you and you are not very fond of these items. If this is the case, you must find ways in lowering cholesterol naturally to help you achieve a healthier body with a well-balanced diet that can sustain you throughout the process. In lowering cholesterol naturally, you have to focus on your diet, lifestyle and additional supplements that can help you in this regard. You have to learn how to control your urges when it comes to food if you want to lower your cholesterol levels. There are indeed many foods that you think you cannot live without, and most of these include the types that can later have big impact on your health, especially your heart and blood vessels. It will help you a lot to stay away from junk foods and try to eliminate processed foods on your grocery list. As much as possible, you must avoid eating red meat. You should also start getting used on avoiding candy bars, pasta, breads, and packaged cereals, among many others. You should begin alternating these with healthier options like soy products, fresh and green vegetables and by drinking lots of water. If you really want to succeed in lowering cholesterol naturally, you must adjust the kind of lifestyle that you are leading. You must limit the times that you go out on venues where you will be asked to drink alcohol and consume foods that are not included on your dietary menu. You must also be serious about your daily exercise routines to keep you in shape as you go about the process. There are many good supplements that you can take when you are on this venture. These may come in capsule form or teas that you must take along with other foods that can help you achieve your goal. Look for the kinds that contain high-quality minerals and calcium. There are many ways in lowering cholesterol naturally without being dependent on drugs. You just have to be committed with the task and make sure that you follow the top recommendations about this for you to succeed with what you want to achieve.